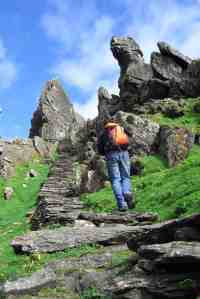 "My Favourite County Kerry Day Trip"
Visiting Skellig Michael is truly unforgettable. 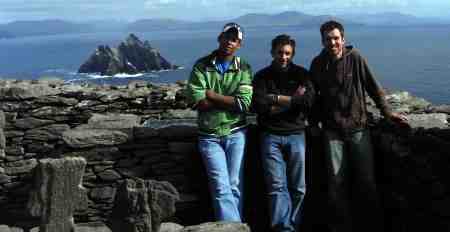 This day trip will stand out as my best memory from my two year stay in County Kerry, Ireland. My friends and I were very lucky! Skellig Michael and Little Skellig were magnificent. With a clear forecast my friends and I stopped working on our holiday cottage and decided to go on a day trip that we had all longed to do – take the ferry to see the famous Skellig Michael monastery. The larger Skellig Michael rises sharply out of the wild Atlantic Ocean and is the site for an incredibly well preserved 7th century Christian monastery. In 1996 it was declared a Unesco World Heritage Site. 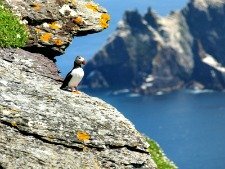 The smaller Little Skellig was never inhabited by the early Christian monks but instead is now home to over 20,000 pairs of gannets. You have to see this to believe it... It’s crazy! We all knew this much about the rocks but we were keen to get out there and see them for ourselves. As we had left our booking till the last minute we were unable to board any ferries at the more popular harbours of Valencia Island and Portmagee. Instead we booked onto a boat which left from Ballinskelligs pier. Ballinskelligs is not on the Ring of Kerry. 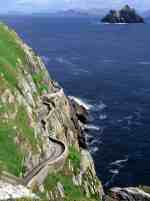 As a result few people ever see this wonderful spot which is located on the smaller but more beautiful Skellig Ring. I highly recommend this short additional drive even if it is just so you can stop and eat the yummy chocolates at the Skelligs Chocolate Factory. Fortunately I knew where Ballinskelligs was as I had taken part in a Kerry coastal rowing race their the previous summer. It was one of my favourite beaches in Kerry and had been one of the hardest races in the rowing season – one of our crew had bet six hundred euros that we would win when he had met an opposing rower drunkenly at a wedding the previous week. Needless to say it was a tough race and our two boats slogged it out right to the finish line. Fortunately we won! We shot around the ring of Kerry from Sneem to Ballinskelligs, arriving with five minutes to spare. 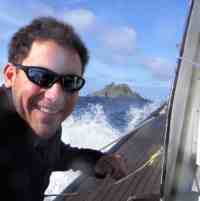 Reassuringly the boat was more powerful and far more comfortable than any of us were expecting. Knowing how quickly the weather can change in County Kerry I was glad to see it had a large area of covered seating, and although we sat out the back admiring the rugged views on the way out it was great to sit inside out of the wind on the way back. 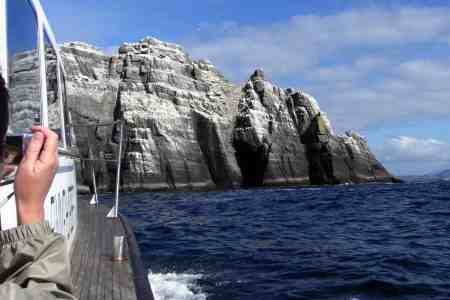 In under an hour we had arrived just offshore of the landing site at Skellig Michael. Along with five or six other boats we all watched and waited as a strong rip tide rolled around the headland affecting our ability to moor the boat safely onto the pier. After a few minutes of watching carefully our guide told us that this was perfectly normal at this level of the tide and that we would have to wait for an hour for the sea conditions to change. Talk about a blessing in disguise! During that hour we were given a full boat tour around Skellig Michael allowing us to see often unseen sides of the island. There are, in fact, two other ancient landing sites that were used by the Monks back in the 7th century. Each has its own set of stone steps intricately weaving up the steep rock faces. Tricky enough walking up these faces let alone lugging stones up them to build them in the first place. We were already amazed by the monk’s workmanship before we had even set foot on the island. We were also treated to an up close visit to Little Skellig. From a distance you can tell there is a huge amount of activity in the skies over this small jagged piece of rock. But as you cruise closer the reality of over 20,000 gannets nesting on the island and zooming around in the sky really hits home as one of Mother Nature’s finest creations! By now the tide was at a level that would hopefully allow us to land on Skellig Michael but as we returned we all noticed a few of the other ferry operators were turning their boats around and heading back to the mainland. Surely we would not give up on attempting a landing that easily! Fortunately our ferryman was more committed. After carefully watching the sets of waves coming around the headland he timed his approach immaculately and before we knew it we were safely tied off up alongside the pier - without doubt a skilful manoeuvre helped on by the superior power of the boat. Once on the rock we were given two hours to explore the monastery. The walk up begins with a well made level track that skirts the base of the island. This was maintained as a supply route for materials and the workers who constructed a light house on Skellig Michael back in 19th century. we were too busy stopping to catch our breaths and the stunning views, of course! I guess it took us no longer than 20 minutes. Anyone with concerns over the climb may be comforted by the fact that you really do have longer than you think on the island. It would be better to climb the steps carefully at your own pace. Even if the climb took you closer to an hour you could still spend fifteen minutes exploring the monastic settlement – it is not a big site – before descending again. And trust me it is worth the effort. The final part of the walk takes you across a natural saddle formation known as Christ’s Valley. 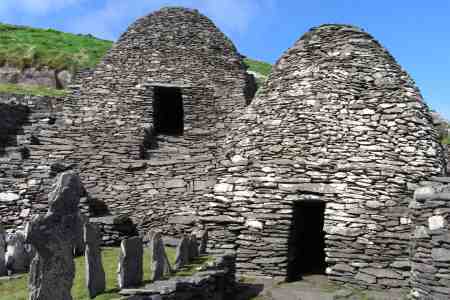 It links the two peaks of Skellig Michael and brings you onto the hand built dry stone terraces upon which the monastic buildings were constructed. The stone terraces and buildings had clung to this rock face for over well over 1200 years. 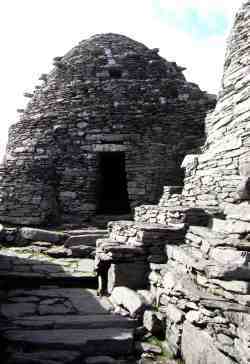 That the reclusive monks had quarried and transported hundreds of tonnes of rock without the help of machinery. And that all the while they were defending themselves from Viking raiders. 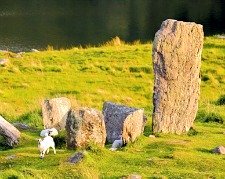 The reason for their hermit like existence came from their belief that union with God could best be achieved through withdrawal from civilisation into harsh and isolated regions. Could they have picked anywhere more remote! We basked in the sun a little longer, looking out across the calm ocean towards the unstoppable activity on Little Skellig before leaving this wonderfully spiritual site to make our way back to the awaiting ferry. It had been a long day and while we had planned to keep a look out for dolphins on the way home we all ended up crashing in the boat out of the wind. I guess like so many other places in the magical County Kerry the appeal of Skellig Michael is that the history and the legends feel almost touchable. The landscape is so unspoilt that it is easy to feel like you are standing in the footsteps of those generations of reclusive monks. It was a great day and although we were fortunate with the weather a great deal of thanks must go to the guys at SkelligBoats.com for their skill and commitment which enabled us to fully experience our trip out to Skellig Michael.